Don Marlowe was born Donald Paul Northrup in Duluth on October 23, 1919. His father, Fred Earl Northrup, was born in Ellsworth, Wisconsin, the Cheese Curd Capital of Wisconsin, on October 21, 1888. By 1910, Fred had moved with his family to Cloquet, Minnesota. Fred first got into the grocery business and later became president of the Paper Products Co. in Duluth. Don’s mother, Sylvia L. (Trudeau) Northrup was born in April 1895, and grew up on Garfield Avenue in Duluth. Her father worked on the coal docks. She and Fred got married on May 1, 1918, after he returned from World War I. When Don was born, the family was living at 812 East First Street, and later moved to 924 Eleventh Avenue East, and 4602 Dodge Street. Don had a younger sister, Marilyn J. Northrup, who was born on May 1, 1926. Don attended Lakeside Elementary School and Duluth Central High School, and in his sophomore year was active in the Sophomore Mask and Wig Club. It seems from the next school year’s yearbook (1935-36) that Don had to repeat his sophomore year. He doesn’t appear in a yearbook after that, so it can be assumed that he didn’t graduate and this was probably around the time he left for California. Don’s career in Hollywood in the 1930s and 1940s is difficult to trace, both because he isn’t listed in any movie roles during that period and because he made questionable claims about appearing in certain films. For example, he stated on many occasions that he played Porky in the “Our Gang” series. It’s pretty clear that he wasn’t in Hollywood when he was that age, and it has been determined that Porky was played by an actor named Eugene Gordon Lee. In Don’s 1969 book, The Hollywood That Was, in which he relates stories about Hollywood, movies, and famous actors and actresses, he makes several other such claims. He writes about acting in the movie Strange Illusion and hanging out with Clark Gable, neither of which is apparently true. One claim that was true was his friendship with Bela Lugosi. At various times, he apparently worked as Lugosi’s agent. 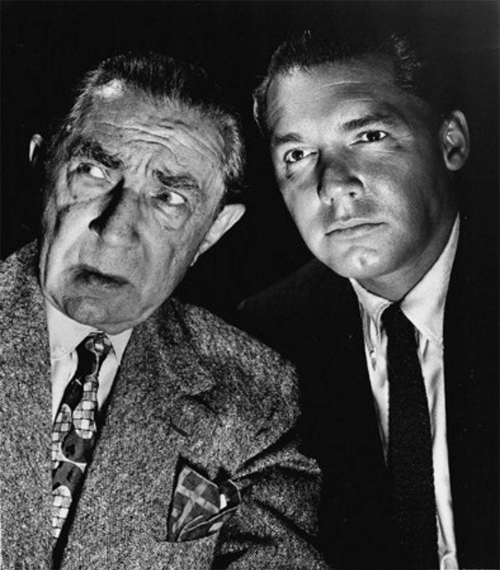 Don did appear in several television series, such as in a role in one episode of Dragnet (1957) and one episode of Sky King (1956), and in uncredited roles in several movies. He was credited for his role as Lt. Wilson in Journey to Freedom (1957). He got a seemingly big break in 1960 when, according to an article in the Duluth Herald, Jack Lemmon walked off the set of the movie Squad Car and the studio, 20th Century-Fox, promptly hired Don to replace him. The film, however, didn’t do very well, and it was apparently Don’s last movie role. Don returned to Duluth several times over the years, probably to visit his mother. Visiting in 1959, he told the Duluth Herald reporter the same old stories about his career. Don died on April 26, 1978, in Santa Barbara, California, where he was living. His mother, Sylvia, stayed in Duluth for the rest of her life, dying on December 12, 1982, in the Aftenro Home.